The holidays have officially arrived, and there will be a lot of opportunities for entertaining friends and family. I love the new beach themed trend in holiday items, and have been busy making a lot of DIY holiday decor that is beach-themed. 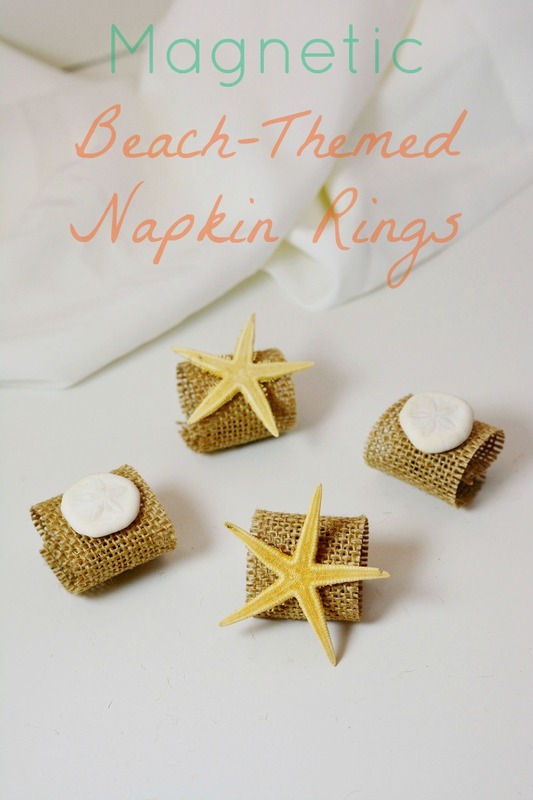 The first item I made were these beach themed napkin rings. I wanted a way to easily put them on the napkins and take them off though since they are fabric. So, I came up with a magnetic closure that makes putting them on a cinch. Check out the tutorial below. Step 1: Measure the length of burlap ribbon that you want to use to make the napkin ring. Close it in a circle to make sure it is the size you would want when finished. Do not forget to overlap the ends by an inch or so to allow space for the application of the magnets. Step 2: Cut the length of ribbon and lay it flat. Glue one circular magnet to the inside of the ribbon on one end and to the outside of the ribbon on the other. You want them to be able to overlap and connect. You can use thinner magnets than we have here, but we used what we had on hand. Step 3: Connect the magnets to form the shape of your napkin ring and then hot glue a shell, star fish or sand dollar to the center of the front of it. That's it, three simple steps to some beautiful beach-themed holiday napkin rings with a magnetic closure. Do you decorate with a beach theme for the holidays? Oh wow! I have a beach themed bathroom! I could make little ribbons to go around the candle holders! You've given me a great idea! Those are so cute, makes me think of spring and how I wish it was warm. Those are so beautiful. And they look easy enough to make that I could do it! Those are super cute! It's great how simple they are to make! I love working with burlap so easy to use, I also love these! Would be awesome to use shells too, which we have a ton of these from when we collect them at the Michigan lakes. Those are adorable! And so easy!